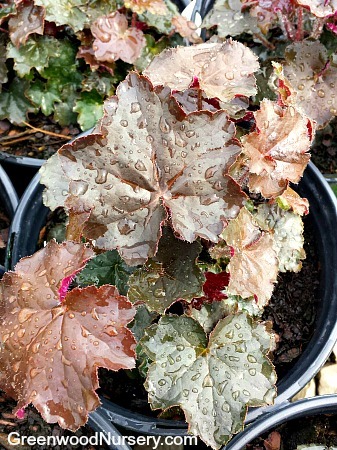 These coral bells also referred to as Alumroot is characterized by delicate skewers of milky-white cone-shaped flowers that sit atop the slightly glossy foliage. They bloom from late spring to mid-summer. The folded leaves are ever-changing, emerging red in spring and shifting to deep green with uniquely dark purple veins. They remain silvery throughout the rest of the year. Planted in mass, the Sormy Seas Coral Bells Hybrid give a fantastic range of foliage color. The dense herbaceous perennial is an evergreen perennial plant with tall stalks. It also features distinctly fine features that make it stand out from other grade varieties. Stormy Seas Coral Bells can be propagated though division and performs well when planted in full sun but will also survive in full shade. Soils should be average to moist. Drying out of the soils will lead to death of the plant. It can thrive in alkaline, neutral and acidic soils. The medium growth rate combined with its hardiness will see this plant live up to 10 years, if well taken care of. You can plant them up to 10 inches apart as they grow and spread to a width of about 23-29 inches. Their small flower heads are purely decorative and cannot be used as cut flower plants. They may, however, be used as dried flowers. The Coral Bells pruning can be done in late fall to prepare for winter. It should be covered with a thick layer of mulch in winter to protect it from the extreme weather conditions. This low-maintenance plant can be used in mass planting, as a border edging plant or as a ground cover plant. In cases where it is used as a potted plant, use is as a spiller for a spiller-thriller-filler combination. They can also be planted outside in baskets or on the patio. This heuchera is deer resistant and rabbit resistant, but it attracts butterflies and hummingbirds. You can find Coral Bells for sale online here at GreenwoodNursery.com. Stormy Seas Heuchera is grown in a trade gallon container. Orders shipping to CA or AZ may be bare rooted before prepping to ship.